An electronic book (also called an e-book, ebook or digital book) is a book in digital form. 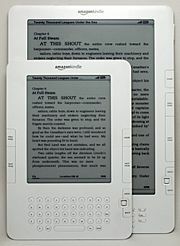 E-books can be read on computers or other electronic devices such as e-book readers. 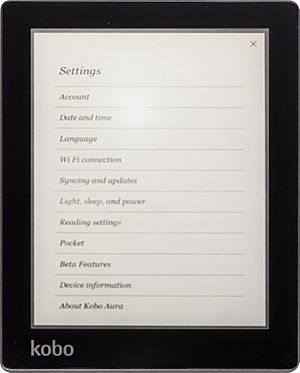 E-book readers, such as the Amazon Kindle, are devices which are dedicated to showing e-books. The first e-book might have been the Index Thonisticus, prepared by Roberto Busa in the late 1940s. However, this is sometimes not not called an ebook because the digital text was (at least at first) meant to develop an index and concordance, rather than as a published edition in its own rights. Despite the extensive earlier history, it is commonly reported that the inventor of the e-book is Michael S. Hart. In 1971, Hart was given extensive computer time by the operators of the Xerox Sigma V mainframe at the University of Illinois. Seeking a worthy use of this resource, he created his first electronic document by typing the United States Declaration of Independence into a computer. 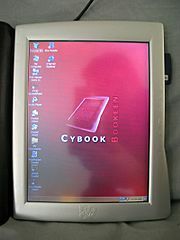 One early e-book was the desktop prototype for a proposed notebook computer, the Dynabook, in the 1970s at PARC: a general-purpose portable personal computer capable of displaying books for reading. After Hart first adapted the Declaration of Independence into an electronic document in 1971, Project Gutenberg was launched to create electronic copies of more texts - especially books. Another early e-book implementation was the desktop prototype for a proposed notebook computer, the Dynabook, in the 1970s at PARC: a general-purpose portable personal computer capable of displaying books for reading. 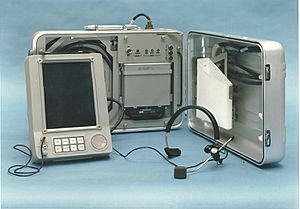 In 1980 the US Department of Defense began concept development for a portable electronic delivery device for technical maintenance information called project PEAM, the Portable Electronic Aid for Maintenance. 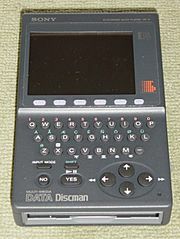 Detailed specifications were completed in FY 82, and prototype development began with Texas Instruments that same year. Four prototypes were produced and delivered for testing in 1986. Tests were completed in 1987. The final summary report was produced by the US Army research Institute for the Behavioral and Social Sciences in 1989 authored by Robert Wisher and J. Peter Kincaid. A patent application for the PEAM device was submitted by Texas Instruments titled "Apparatus for delivering procedural type instructions" was submitted Dec 4, 1985 listing John K. Harkins and Stephen H. Morriss as inventors. Although the demand for e-book services in libraries has grown in the decades of the 2000s and 2010s, difficulties keep libraries from providing some e-books to clients. Publishers will sell e-books to libraries, but they only give libraries a limited license to the title in most cases. This means the library does not own the electronic text but that they can circulate it either for a certain period of time or for a certain number of check outs, or both. When a library purchases an e-book license, the cost is at least three times what it would be for a personal consumer. E-book licenses are more expensive than paper-format editions because publishers are concerned that an e-book that is sold could theoretically be read and/or checked out by a huge number of users, which could adversely affect sales. 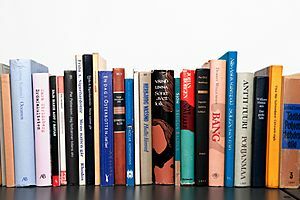 Some e-books are produced simultaneously with the production of a printed format, as described in electronic publishing, though in many instances they may not be put on sale until later. 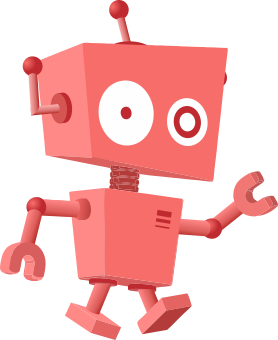 Often, e-books are produced from pre-existing hard-copy books, generally by document scanning, sometimes with the use of robotic book scanners, having the technology to quickly scan books without damaging the original print edition. Scanning a book produces a set of image files, which may additionally be converted into text format by an OCR program. Occasionally, as in some projects, an e-book may be produced by re-entering the text from a keyboard. Sometimes only the electronic version of a book is produced by the publisher. [examples needed] It is possible to release an e-book chapter by chapter as each chapter is written. [examples needed] This is useful in fields such as information technology where topics can change quickly in the months that it takes to write a typical book. It is also possible to convert an electronic book to a printed book by print on demand. However, these are exceptions as tradition dictates that a book be launched in the print format and later if the author wishes an electronic version is produced. The New York Times keeps a list of best-selling e-books, for both fiction and non-fiction. 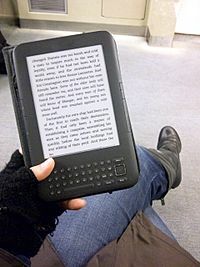 In the space that a comparably sized physical book takes up, an e-reader can contain thousands of e-books, limited only by its memory capacity. Depending on the device, an e-book may be readable in low light or even total darkness. 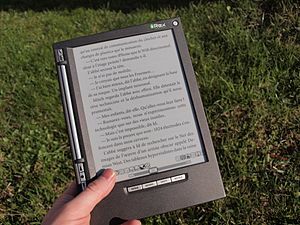 Many e-readers have a built-in light source, can enlarge or change fonts, use text-to-speech software to read the text aloud for visually impaired, elderly or dyslexic people or just for convenience. Additionally, e-readers allow readers to look up words or find more information about the topic immediately using an online dictionary. Amazon reports that 85% of its e-book readers look up a word while reading. E-books apps often have built-in features like search and cross-references, links to hypertexts, tags, annotations, underlining, multimedia objects and interactive tools that are helpful for students in a learning environment. Printed books use three times more raw materials and 78 times more water to produce when compared to e-books. While an e-reader costs more than most individual books, e-books may have a lower cost than paper books. E-books may be printed for less than the price of traditional books using on-demand book printers. Moreover, numerous e-books are available online free of charge on sites such as Project Gutenberg. For example, all books printed before 1923 are in the public domain, which means it's free to obtain e-book versions of them. E-book Facts for Kids. Kiddle Encyclopedia.